This past summer my friend invited us for a July 4th celebration party. She’s an amazing host and hosts a party for 20-40 people at once. She lives in Long Island, has a pretty big entertainment space, nice large kitchen, huge backyard, that is why she’s able to host such big parties! I’m honored we’re always invited! She is also an amazing cook and tries to experimenting with healthy dishes and appetizers. This year on the appetizer table I noticed something different. It looked like a potato salad. I asked her what’s this? She said it’s a potato salad “Finnish style” ( yes, my friend is Finnish). So my other Swedish friend and I started trying the potato salad. We both awww’ed and wow’ed and we could not stop mingling it. The salad was great by itself, as a side dish and I also liked it on a piece of a chip dipper. The Swedish girl made a comment – “It’s the potato salad that is from out of this world!” – she said. I agreed! So about few weeks later I text my Finnish friend asking for a recipe. The ingredients are quiet simple and the salad was easy to make. 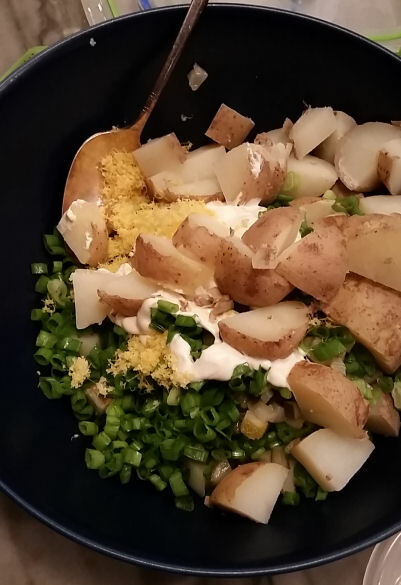 It called for potatoes, green onions, pickles, lemon peel, lemon juice and mayonnaise. I never added a lemon peel to my salads before, so I asked her, can I just add the lemon juice instead? She replied that yes, I can add the lemon juice (depends on how lemony I like it), but the peel is more important. I made my salad. It came out good, but not as good as my friend’s salad, because my grater was so dull, I couldn’t grate the lemon peel, but the recipe asked for at least 2 tea spoons. 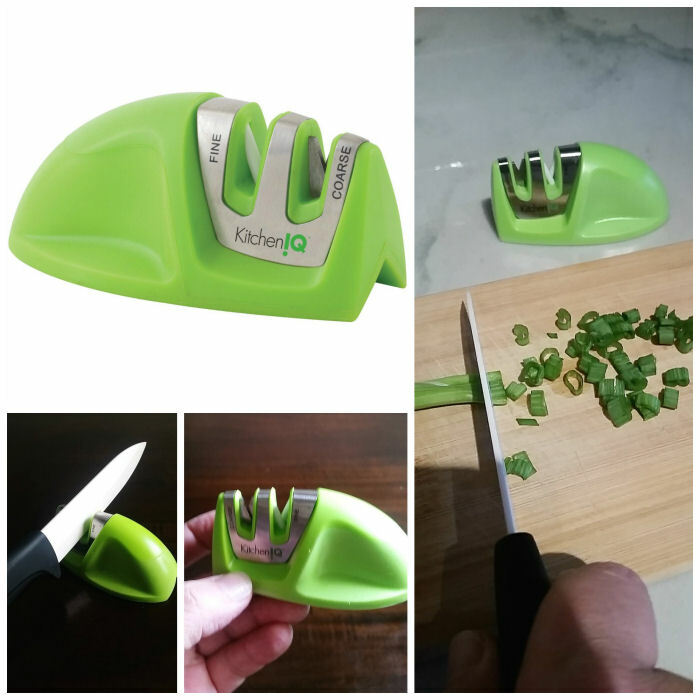 A couple of weeks ago the company called KitchenIQ reached out to me asking me to review their new kitchen gadgets, such as Better Zester, pairing knife with brush and potato peeler and the edge grip knife sharpener. 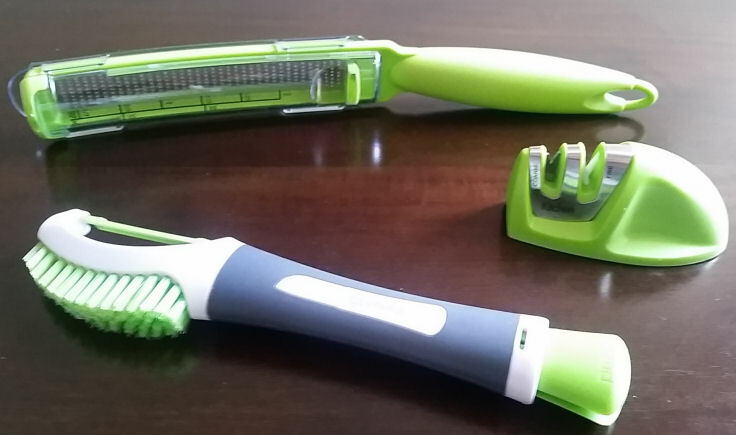 I could not be more excited about all 3 of these handy kitchen tools. Since KitchenIQ asked me host a party and sent me their 3 newest kitchen gadgets and not just 1 but 5 better zesters so I can demonstrate them at the party and show to my friend how great this product is, I quickly made up a plan in my head to surprise my Finnish friend! It was the most perfect opportunity as last weekend my family and I attended a birthday party that was hosted by my Finnish friend and her husband. I thought this would be a great opportunity to show them some of my new kitchen gadgets from KitchenIQ. I brought along my new zester, pairing knife with brush, and of course the edge grip knife sharpener all from KitchenIQ. In order to show them how well all of these products work, I also brought along my famous potato salad dish that is from out of this world!. Well I didn’t make the salad YET, I just brought all the ingredients, it was basically the cooked potatoes and other ingredients that were ready to be sliced, diced, and zested. Okay so zested isn’t a real word but it sounds good. 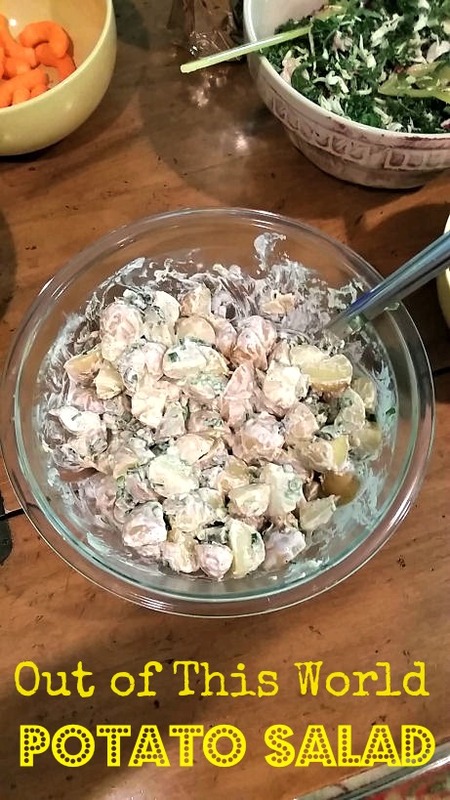 We arrived at our friend’s house in the afternoon and after saying hello to the other guests I asked the host where I could prepare my potato salad. She cleared some counter space for me and I took out my KitchenIQ Better zester, pairing knife, and edge grip knife sharpener. As soon as I took out the Better zester I heard a myriad of “What is that?” coming from all around the kitchen. I told them all that it is my new zester/grater from Kitchen IQ. They all came over and wanted to see it closer and give it a try themselves. My potato salad recipe calls for 1-2 tablespoons of lemon zest so I let them all give it a try. 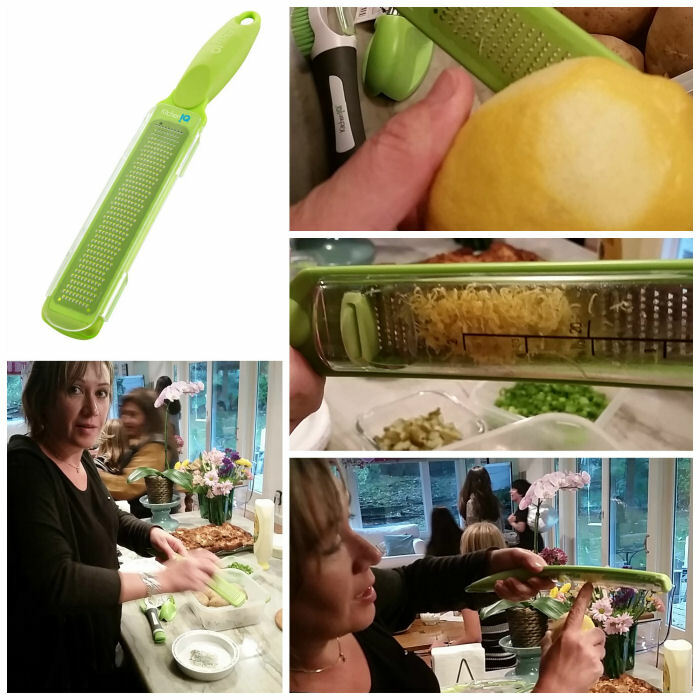 They all really liked how easy it was to use and they especially liked the attached compartment that held and measured the fresh lemon zest. What they liked even more is when I announced that I had KitchenIQ Better zester/graters for each of them!. This is truly a fantastic product and it felt great to be able to share them with my friends. I then took out the KitchenIQ knife sharpener and asked the host to bring me the sharpest knife she had. First I sliced and chopped a bunch of green onions using her knife. It cut pretty decently but I noticed that the scallions were frayed and torn rather than sliced evenly. I then ran her knife through the Edge Grip Knife Sharpener several times and sliced and diced another bunch of green onions. This time the knife when through the green onions much more smoothly. The result was finely sliced green onions with no frays or tears. With just a few passes through the Kitchen IQ Edge Knife Sharpener her knife was as sharp as the day she first bought it. Now that is a product that I would want to have in my kitchen. Now the last gadget from KitchenIG I used is the Potato Tool. 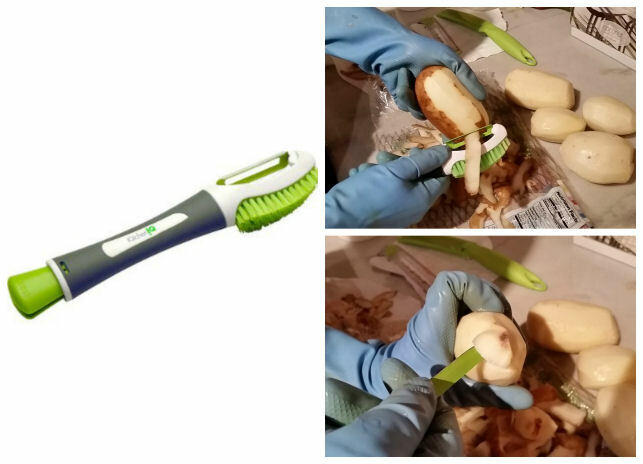 This very handy tool is actually 3-in-1 multi- tool to clean, peel and slice potatoes and other vegetables quickly and easily. The brush lets me clean potatoes very nicely and clean. The coarse bristles scrub dirt off easily. The sharp blade allowed very smooth peeling. And the small paring knife easily removes bad spots or eyes from potato or vegetables. I LOVE this tool! It is a great space saver with the paring knife tucked into the peeler’s handle. What an awesome idea! 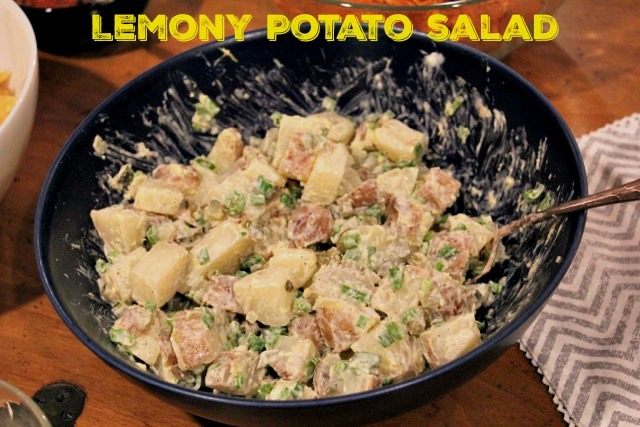 For this Lemon peel salad you actually don’t need to peel the potatoes. Just scrub them with the brush to remove dirt from skin. Leave the skin on potatoes and boil them with skin on. Boil the potatoes (not too soft, about 10 minutes) and cut to bite size pieces. Then mix peel into a few tablespoon of mayonnaise. Add salt, pepper, and mix everything and done!